I had the pleasure of meeting with one of our local orthopedic surgeons, Dr. Benjamin Bjerke, and the Zimmer-Biomet rep, Christina Escobar, to talk Mobi-C Disc Replacement technology and surgical technique developed by Zimmer-Biomet. Incredibly interesting. Seeing the prosthesis, my first question was, “Is this a model or the real thing you are showing me?” It was much smaller than I anticipated! Secondly, I found the specificity of the patient suitable for this intervention impressive – someone with neck pain and or radiculopathy (pain down the arm originating from nerve root compression in the neck) without much cervical spondylosis (degeneration of the discs and joints in the neck) and good vertebral alignment. The Mobi-C can replace discs at one or two levels of the cervical spine between the third and seventh cervical vertebrae. So lets take a look in more detail. Before artificial discs were available, patients would traditionally receive an Anterior Cervical Discectomy and Fusion procedure to alleviate the pain from a herniated disc. In a fusion surgery, the disc is removed and either a bone spacer or a plastic implant is placed in the disc space to restore disc height and remove pressure on the pinched nerves or spinal cord. A metal plate and screws is placed on the front of the vertebral column to hold the implant in place. The result – a segment that no longer moves, or is “fused”. The potential downside of a fusion procedure, in addition to the loss of motion, is that it can create additional stress on the spinal levels above and below it. This can cause degeneration at those levels and potentially result in another future surgery. An artificial disc like Mobi-C is an option instead of a fusion that will also be placed inside the disc space to restore height and remove pressure on the pinched nerves. However, the Mobi-C device is designed to allow the neck to maintain normal motion and thus limit adjacent levels from degenerating, possibly preventing future surgeries. A growing library of clinical evidence demonstrating the long term safety and efficacy of cervical disc replacement. Cervical disc replacement is being shown as a superior treatment to fusion for use at two cervical levels. Better outcomes of cervical disc replacement over fusion such as reduced re-operation rates, reduced adjacent segment degeneration rates and surgeries, as well as a faster return to work. Most patients return to work within six weeks of surgery. In the U.S. Mobi-C clinical trial, the return to work time was 20.9 days shorter for Mobi-C patients compared to fusion patients for two-level surgery and 7.5 days shorter for Mobi-C patients compared to fusion for one-level surgery. What about physical therapy after the Mobi-C disc replacement? Wear a neck collar to lessen neck movement for around a week after the surgery. Avoid heavy lifting, repetitive bending, and prolonged or strenuous activity for up to 6 weeks after surgery. When your surgeon releases you to start physical therapy the physical therapist will do a comprehensive evaluation to assess your cervical, scapular and shoulder range of motion as well as cervical, arm and trunk strength. Based on the data collected, you will be given specific exercises to address any deficits to ultimately improve your function. You may start of with cervical isometrics and progress to upper thoracic and arm strengthening exercises as well as neuromuscular reeducation of the deep neck muscles. The physical therapist will also utilize soft tissue mobilization techniques to limit scar formation and address any myofascial pain and muscle trigger points, present from inactivity. You will need to participate fully by being totally compliant with the home exercise program you are given by the physical therapist at your very first visit. Successful outcomes are determined by multiple factors which include choosing the right surgical procedure done by a skilled surgeon, following post operative activity limitations and brace use as well as being totally compliant with physical therapy instructions and exercises. It is a 3 person team that makes your recovery work: you (and your home supporters), the surgeon (and their staff) and the physical therapist (and their clinical team members). Thank you to Zimmer-Biomet for help with supplying me with information and photographs. 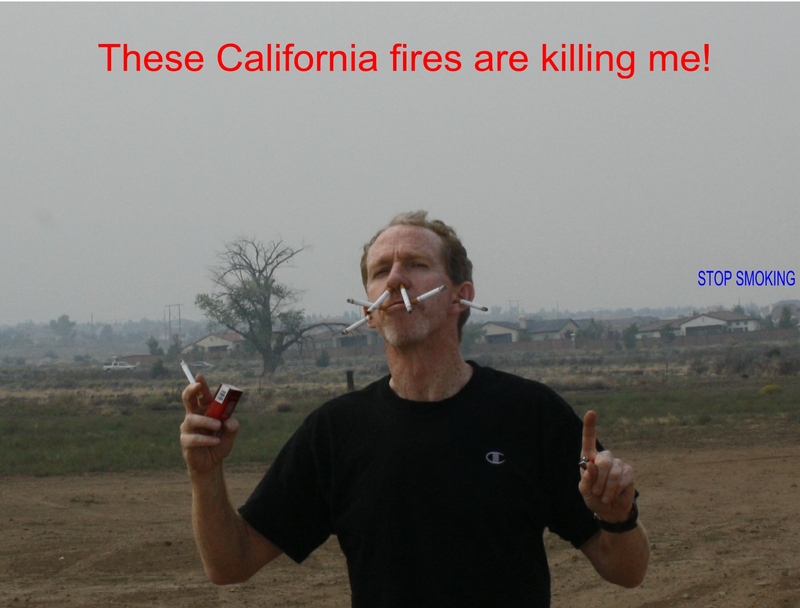 Smoking, Health and Forest Fires. Living in Reno, Nevada, we are frequently engulfed in smoke from forest fires around the area. Last year it was the big Yosemite fire, this year we were living under a blanket of smoke from the massive King Fire just east of Sacramento, California. Air quality was in the unhealthy range day in and day out. With clean air in the Truckee Meadows so dependent on the wind direction, we were praying for wind direction changes and the return of our Nevada blue skies. Someone told me about a scene he saw at his work during the time we were blanketed in smoke. He left for lunch and walked past the smoking area outside the building. He saw two people smoking outside in the already smoky air and one waving her hand, cigarette in the other, “This smoke is killing me!” We humans are a funny bunch! So I thought I would have some fun with that and take a photo. My disclaimer: I am not a smoker and never have been and boy did I learn something about smoking in the brief 10 minutes I had cigarettes going for the photograph! My wife did not enjoy our first kiss. My clothes smelt of smoke immediately afterwards and this did not disappear until I washed them. I had to brush my teeth and take a shower right away. If I disliked it so much then it must be addicting as I struggle to believe those who have chosen to smoke don’t eventually bypass these sensations and thereby continue to smoke. People change because the pain of their present situation (smoking) is more than the pain of making the change (the withdrawals after stopping?). The pain of smoking depends on the individual and is different for each person. Some may see their wife pregnant and decide to stop smoking on account of the youngster about to be born. Some will have significant ongoing disease and still keep smoking (not painful enough yet). I have even spoken with someone who had simply given up as the disease process had gone too far. I feel somewhat cheap talking about smoking cessation as I am not a cessation specialist nor am I a smoker who has kicked the habit. I have a real interest in why people change. This is the reason for my post. That being said, I recently met an incredible man. During his lifetime he stopped alcohol, methamphetamine, smoking and violence all cold turkey! How is it he was so strong and quit all those things and many of us struggle? I really enjoyed Laura’s blogging of her total knee replacement. I think this is a great idea and one which can help other people who are potential knee replacement candidates get a sense of what the process looks like from a patient’s perspective. Great job, Laura. We all hope you are doing well. Tendinitis is the inflammation of a tendon and of tendon-muscle attachments i.e. where the tendon attaches to the bone (insertional tendinitis). It is an overuse phenomenon, can be excrutiatingly painful and functionally debilitating. Treatment should focus on addressing the cause of the tendinitis, reducing the inflammation and the pain, and remodelling the tendon through a controlled exercise progression. Most frequently seen diagnoses in our physical therapy clinic are rotator cuff tendinitis (supraspinatus tendinitis), posterior tibial and peroneal tendinitis (pain in the foot and ankle), tennis elbow (lateral epidondylitis), achilles tendinitis, patella tendinitis and iliotibial band syndrome. Interestingly, we have recently been seeing an increase in tendinitis of the guteus medius (hip abductor muscle). We see golfer’s elbow (medial epicondylitis) less frequently than tennis elbow. Treat the cause of tendinitis. It does not matter what tendon is involved, the cause is most frequently overuse. Overuse means the stress the tendon has had to endure, as a result of the force it is being asked to apply (both intensity and frequency), results in microtrauma to the tendon structure and hence inflammation. If the tendon is not given rest, it does not have the opportunity to recover. Examples of activities which can result in tendinitis include typing, repeated gripping on a production line, fly fishing, overhead lifting or repeated jumping. Ankle sprains may cause tendinitis in the posterior tibialis and peroneal tendons of the foot. So, the first line of attack is to decipher what the causative activities are and modify them. For most rapid resolution, these should be stopped completely to avoid the continuous trauma to the tendon. Sometimes this is not possible and a program of relative rest must be designed by the physical therapist:patient team. Part of controlling the inflammation is reducing the stress on the tendon. The physical therapist will address this with you in detail. As mentioned above, rest gives the tendon the opportunity to recover from the microtrauma (as noted above). Non-steroidal anti-inflammatories or even streroids may be prescribed by your physician at the same time. Physical therapy interventions to control inflammation include ice in the form of an ice pack or even ice massage and, iontophoresis – the administration of an anti-inflammatory, dexamethazone, to the tendon utilizing electrical currenct to faciltiate the passage of the medication through the skin (Yes! No needles!). By following the above suggestions, pain should subside over time as the inflammation is controlled. If the pain is severe enough your physician may subscribe analgesics (pain killers). Here is where the work is! Your physical therapist will teach you how to stretch the involved tendon as well as progress you through a specific exercise regimen which involves both concentric and eccentric exercises which will stress the tendon. A concentric exercise is one in which the muscle contracts and shortens at the same time e.g. the bicep contracts to bend the elbow bringing the coffee cup to your mouth. An eccentric contraction is one in which the contracting muscle is lengthening while it contracts e.g. the bicep contracts and lengthens as it controls the extending elbow to put the coffee cup back down on the table. An eccentric contraction places more tension on the tendon than a concentric contraction and can thus promote tendon remodelling. Eccentric exercises are more aggressive than the concentric type. The goal of the stretching and strengthening progression is to stimulate tendon remodelling. This improves the flexibility and tensile strength of the tendon. This, in turn, improves the tendons ability to tolerate the original activity which caused the tendinitis. Soft tissue mobilization? Deep transverse friction? What about soft tissue mobilization and deep transverse friction? Soft tissue mobilization of the involved muscle belly and, indeed, of the surrounding musculature can be helpful in alleviating discomfort. It is less aggressive than deep transverse friction and is definitely more comfortable. Deep transverse friction is used to stimulate blood flow in the involved tendon and break up any adhesions which may have developed as a consequence of the microtrauma of the tendinitis. It is done by applying significant pressure (up to 7/10 pain) over the tendon with the thumb or index finger and rubbing in a direction transverse to the direction of the tendon fibers. Sound like fun!? It is done in conjunction with the tendon remodelling exercises detailed above. Make sure you visit us early on in the process because it is much easier to treat than if you have had tendinits for more than a few weeks. EARLY INTERVENTION! Make sure you specifically ask to be sent to physical therapy the very first visit you have with your doctor so you can be shown the specific exercises and enjoy the hands-on treatment from the physical therapist. Pass this on to someone you know who has tendinitis. Call us with any questions you may have: 775-331-1199. Part 2: The Global Leadership Summit 2011. Day 2 (see last week’s post for day 1 summary) of the Global Leadership Summit started with 3 incredibly different sessions highlighting 3 individuals who have done great things in their own sphere of influence while facing different obstacles. The message I came away with is this: We all face obstacles every day and it is how we view these challenges that makes us leaders and makes us accomplish great things. 1. Dedication to a cause, the one thing you find drives you to stay the course, to get up each time you fall down, is not easy and often may involve sacrifice. Next up was Mama Maggie, the Mother Teresa of Cairo and Nobel Peace Prize nominee. She has spent more than 20 years serving the poorest members of Cairo. She works with kids living and sleeping and eating in trash dumps! She profiled families with nothing, absolutely nothing. Mama Maggie was quiet yet strong. She was the depiction of faith. She is a very strong leader as a consequence. She held the podium with ease in her calmness. Indeed, this is a woman who is the Founder and CEO of Stephen’s Children Ministry. What did I draw from her message? 1. Life can be hard but with faith we can all persevere. 2. The world around us needs people who are willing to give of themselves, to listen to others in need and to care. 3. We don’t choose where we are born but we do choose what we do with our lives. “Silence your body to listen to your words. Silence your tongue to listen to your thoughts. Silence your thoughts to listen to your heart beating. Silence your heart to listen to your spirit. How does this relate to physical therapy? Clinicians need to be compassionate towards their patients. We must listen to them. There is not enough listening and too much “telling” in the healthcare environment these days. Patients must know they are going to get better if they give all they have got to the process. This means we need to have faith in what we do and who we interact with. 1. You cannot lead if change isn’t happening. I think this applies to all of us in leadership positions. Our job is to create change and take people through it by addressing their fears. Physical therapists lead their patients from the challenging position of lacking function due to pain into a new place which frequently requires a change in habits. It’s our job and we love it. We see a lot of people who the healthcare system has failed. They have seen multiple physicians, had numerous expensive tests done, had various invasive interventions, had physical therapy which did not result in any benefit and are not happy with still being in pain months or even years later. As with Michelle Rhea, I would rather deal with patients in this situation that have been angered and have taken charge of their care. As I wrote in the blog posted on 18 July, 2011), patients often recognize that they need to get involved after the healthcare system has failed them. I suggest you get involved by being educated and asking questions and demanding better care before you get angry. Dr. Henry Cloud, a clinical psychologist, author and leadership consultant then took us on a journey through the different kinds of employees a leader may need to interact with. The categories may surprise you: The wise, the fool, the evil! 1. The Wise: They respond well to critique and appreciate the feedback which they use to better themselves. Strategies to help the wise? Talk to them, coach them and challenge them. 2. The Fool: They shoot the messenger, don’t own the problem and get angry following critique. Strategies? Get them to come up with their own solution to a problem or behaviour you need corrected within a set timeline. If this does not correct the problem after they have addressed it their way …… see you later. 3. The Evil: These people have organizational destruction in mind. Watch out for lawyers, guns and lots of costs. 1. Humility is common sense. He stated, what you know and can do is far less than what you don’t know and can do. Think of a truly humble person and tell me that they are not beautiful. Think about someone who is not humble. Truly humble people are in a place of flourishing. To persuade someone you need to be trusted. To be trusted you must have a character full of humility. I think of my hero, Nelson Mandela, a truly humble man of immense greatness. What of Mama Maggie!? How are you doing with humility these days? Patrick Lencioni, a very dynamic and funny speaker, kept us riveted on “Naked Service.” His book, Getting Naked, must be a very interesting read. Getting naked refers to allowing yourself to feel vulnerable by being who you are. We all have difficulties being ourselves sometimes for some reason and he listed some of them. Be vulnerable and go for it. Tell the truth. 2. Fear of being embarrassed. “Do not edit yourself to manage your image.” Celebrate your mistakes as you learn from them. Ask lots of questions to gain understanding and hence educate yourself. 3. Fear of feeling inferior. You must have a genuine desire to serve your clients. Honor your clients work. As a leader, be willing to do some of your employees’ dirty work. Overall, you cannot enjoy success without the potential for some pain. 1. Look these speakers up on the internet and buy one of their books. You will not be disappointed. 3. How might you be more real to yourself? 4. Are you giving yourself “Naked Service” in your quest for better health, better happiness, a better life? It is Your Right to Choose Your Physical Therapy Clinic. At Custom Physical Therapy, we come across many people who are not aware that it is their right to choose where they do their physical therapy. We also see patients who do not know that they can (and should) request their doctor to refer them to physical therapy if they think they need it. Most people are referred to us by their physician, physician’s assistant, nurse practitioner, case manager or chiropractor. These providers partner with us in your recovery. We work together, as your “recovery team”, to provide the needed interventions for your speedy recovery. What about you? How should you be involved in the decision-making process? 1. You must be an informed consumer of healthcare. Thus this blog! We want you to use this blog as an information source, a place to discuss (POST) your questions with other members of the Custom Physical Therapy community and our clinicians. Learn! Learn! Learn! Being informed takes effort on your part. We are here to answer any questions either by phone, in person or after you post them on the blog. Your choice. Obviously, we cannot give you concrete medical advice through the blog but we can give you access to information that may be in our head! We can direct you to appropriate resources if need be. This is an invitation to you whether you are a patient of ours, a prior patient or someone who has not visited our three clinics at all. 2. Actively participate in your healthcare. To do this you need to be informed sufficiently to ask questions. Yes, you need to ask questions. Lots of them! Ask questions until you understand what interventions are being proposed by your doctor, nurse practitioner, physician’s assistant, case manager, physical therapist or chiropractor. This new understanding you have allows you to accept or reject what interventions we propose. You can also request other interventions – as long as you, the patient, are informed, i.e. you have done your homework! Educate yourself then actively participate in your care. 3. Make sure you know who you want to treat you. Which clinic you attend and which provider (physical therapist) you want to be treated by is your choice. As long as they are on your insurance provider list (in-network) you will be covered by in-network benefits and typically pay less out-of-pocket than if you see someone who is out-of-network. You can, however, go out-of-network if your provider of choice hasn’t signed a contract with your health insurance company. You may then have a higher out-of-pocket expense. At Custom Physical Therapy we try to match your out-of-network out-of-pocket cost to your in-network cost. So, never think you cannot see us if we are out-of-network. We will check your benefits and let you know what your out-of-pocket cost will be before you schedule your first appointment. When should you request physical therapy if your doctor or other healthcare provider does not recommend it to you? For any musculoskeletal issue there is a high likelihood physical therapy will benefit you. Afterall, we specialize in the rehabilitation of musculoskeletal problems. These include, but are not limited to, low back pain, neck pain, headaches, shoulder problems (weakness, pain, stiffness), arm and leg problems, ankle sprains, and numerous other conditions. If you are unsure, call us at one of our clinics and we will be honest with you and tell you if we are an appropriate route to get you back to full function. Regarding low back pain, research has documented the longterm benefits of physical therapy when started within 2 weeks of the onset of low back pain. Treatment with medications only (anti-inflammatories, muscle relaxers and/or pain killers) and no physical therapy resulted in an 85% reoccurrence within 1 year of resolution of the episode of low back pain, which took 3 months on average to resolve. Medical management combined with physical therapy (specific exercises and manual therapy interventions) only had a 35% reoccurrence! That’s a huge difference! Worthwhile I would say! It is totally appropriate for you to request physical therapy at the initial visit to your doctor for your low back pain. Another condition where you should specifically request physical therapy immediately is for an ankle sprain, even if it is a slight one. Chronic ankle sprains may occur if early rehabilitation is not pursued. There is a greater likelihood of arthritis in the ankle joint each time you traumatize the joint by spraining it. Research on ankle sprains shows that one sprain leads to another and then another if the brain’s ability to control the ankle in unstable situations (known as proprioception) is not retrained. This involves being instructed in specific exercises to enable the brain to “adjust” to the faulty information, due to the ankle sprain, arising from the muscles, ligaments and tendons which control the ankle joint. Be proactive with your healthcare and learn as much as you can. Ask questions to gain understanding. You choose who you see for physical therapy. You can and should request physical therapy when you think it is needed. Post a question concerning your health on this blog. If we do not know the answer, we will find it for you from another expert in the field. Check out the videos on the blog and rate them. Why do you think they are good? What topics would you like to see covered in this blog? Ask a friend to do action 1 through 3 above. This will get our information out to many others with your help. See you for the next post! Plan on once a week visits to this blog for new information!